"The satellites of extrasolar planets (exomoons) have been recently proposed as astrobiological targets. Since giant planets in the habitable zone are thought to have migrated there," says Simon Porter of Lowell Observatory and William Grundy of Arizona State University in an interview with Universe Today. "It is possible that they may have captured a former terrestrial planet or planetesimal." "We therefore attempt to model the dynamical evolution of a terrestrial planet captured into orbit around a giant planet in the habitable zone of a star." added Porter and Grundy. "We find that approximately half of loose elliptical orbits result in stable circular orbits over timescales of less than a few million years. We also find that those orbits are mostly low-inclination, but have no prograde/retrograde preference." 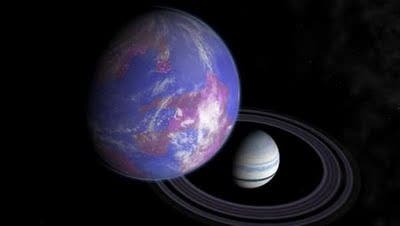 The most likely candidates for "living" exomoons would be around planets very similar to Neptune and orbiting a star similar to our Sun. Once these Earth-massed satellites have stabilized into a long-lived orbit, they should be within the range of findability using the transit timing variation much stronger than the duration variation – even if their orbit is tight to the parent planet. "In addition, we calculate the transit timing and duration variations for the resulting systems, and find that potentially habitable Earth-mass exomoons should be detectable." reports the team. "Even with these closer orbits, some exomoons are still within the range of detectability. The combination of TTV and TDV may offer a stronger detection signal than photometry for these orbits, though both could detect some of the orbits produced."